Noynoy is in Yokohama, Japan, for the yearly Asia-Pacific Economic Cooperation (Apec) forum Leaders’ Summit that starts today with most of the nation clueless on what his purpose is, in attending the grand event. Admittedly the Apec meetings were the most elaborate social events that leaders of Pacific Rim countries were obliged to attend yearly since it was formed in 1989. The more memorable parts of these yearly gatherings are dressing up the leaders with whatever the host country may think of. Silly or not, they have to wear these. The official raison d’etre of Apec is the opening up of trade among 21 signatory countries to usher the biggest free trade area in the world comprising approximately 40 percent of the global population, 54 percent of world economic output, and about 44 percent of world trade. Noynoy may not realize it, but almost everytime he snipes at his predecessor, Gloria Arroyo, he comes off sounding and looking ridiculous, mainly because what he really is doing is taking credit for something that he did not do, nor was even around to be a part of it. Take his bragging about the economy doing well, which he incorporated as one of his achievements for his 100 days report. It certainly wasn’t because of him that the second quarter economic growth had risen. He wasn’t president for that quarter and he certainly had nothing to do with the growth. What he was doing was stealing the credit and he certainly knows it. Noynoy even took the credit for that claimed $2.4 billion in investments, as well as the Millenium Challenge deal, all of which were already clinched during Gloria’s time. When the session resumed on November 8, members of the House of Representatives were being asked to vote on the proposed budget. ACT Teachers Rep. Antonio Tinio stood up and asked if they could still look into the amendments that were considered and included in the final version of the bill. The request, however, was denied. MANILA — The P1.645-trillion ($37.63 million) budget for 2011 has been passed at the House of Representatives on its third and final reading by a vote of 175 for and 21 against last November 8. But progressive party-list groups, which voted against it, have not given up the fight and are explaining its flaws to the public. In a press conference on November 9, progressive party-list representatives explained why they voted against the 2011 budget. “It is a distorted budget, skewed against the people,” Gabriela Rep. Luzviminda Ilagan said. She added that the voting took them by surprise because they were expecting that the plenary session would tackle the proposed amendments that were submitted to the Committee on Appropriations. On October 16, House Bill 3101, or the General Appropriations Bill for 2011, was passed on second reading. House Speaker Feliciano Belmonte Jr. explained that the budget was “meticulous, down to the smallest but important detail.” During the session break, however, progressive party-list representatives said that only a “small group” looked into the amendments that was supposed to be discussed during the third reading. We are like many Filipinos, the leaders of various health workers and health professionals in the public health sector said they dream of having a decent house, enrolling their children in quality schools, and providing for their family’s basic needs like food, clothing and recreation. But sadly, they could not make both ends meet. MANILA – The Philippines is a ranking exporter of nurses in the world, but a “modest estimate” of a nurses’ organization places the number of currently unemployed Filipino nurses in the country at 280,000. Yet, amid the seeming surplus of nurses, many Philippine public hospitals sorely lack nurses. Why is this so? Answering it properly would require a hard look at the condition of the country’s public health care system. A festering problem afflicting the public health care system is the working conditions of health care workers. 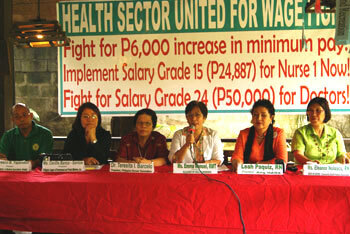 “We are the doctors, nurses and health workers in public hospitals, health clinics and institutions. We are committed to serving Filipino patients amid the low health budget, understaffing, inadequate equipment and facilities, and inadequate salaries and benefits,” the united health sector said in a statement. MANILA – Narcisa Claveria or Lola Isa, 80, vividly recalls her horrible experience with the Japanese Imperial Army during World War II. Lola Isa is one of the 174 comfort women who bravely went public to demand justice from the Japanese government. Lila Pilipina is an organization of comfort women who survived the Second World War. It was formed in 1994 under the auspices of the women’s group Gabriela. Prior to Lila Pilipina, in July 1992, the Task Force For Comfort Women (TFFCW) was organized by Bagong Alyansang Makabayan (Bayan) together with six women’s organization. The TFFCW through its massive media campaign encouraged victims of sexual slavery during the Japanese occupation to come out and hold the Japanese government accountable. In 1992, after more than half a century of silence, the women who were repeatedly abused by Japanese soldiers finally came out to tell their stories. Maria Rosa Luna Henson was the first. The Horror of 1943 There are 174 cases of comfort women that were documented by Lila Pilipina, 65 victims have already died. 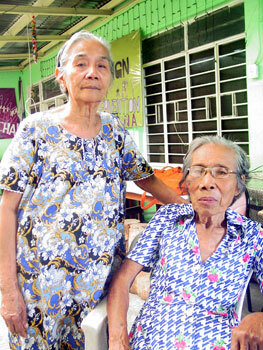 The remaining 109 lolas are still willing to continue their struggle for justice despite their age. “We would not stop until we achieve justice. We experienced extreme exploitation at the hands of the Japanese during the war,” Lola Isa said tearfully. Despite their age, Lola Isa and 84-year old Pilar Frias could still remember vividly how they were repeatedly raped by Japanese soldiers. While owners of big name brands ranging from Apple to Nokia to HP and JVC Kenwood roost in their headquarters in the US or Europe and try to outdo each other in bragging about their latest research and development, their supply chain around the world is comprised of different outsourcing companies vying for the contract to manufacture their required parts at the lowest production costs possible. MANILA – Some of the most requested gifts these coming holidays are electronic gadgets. This early, shops are already bedecked in tinsel and promos to lure buyers of the latest televisions, digicams, cellphones, music players, computers from desktop to laptop to netbook to its latest evolutions such as the likes of Ipads, e-book readers and tablet PCS. In ads of big brand names such as Nokia, Apple, HP, Dell, Sony and Sony Ericsson, JVC, Samsung, among others, these electronic gadgets are credited for “connecting people” if not shrinking the distance between people. But while these gadgets are being marketed for doing that – connecting people – the process of producing them involves a fragmented global supply chain, where big brand names outsource their supplies and parts from different manufacturing plants located all over the world. Big manufacturers, which are mostly located in export processing zones, strive to produce according to strict specifications but in the cheapest possible cost of production, so they could reap profits despite having lowered their contract price to bag the outsourcing contract. President Aquino and officials of flag-carrier Philippine Airlines (PAL) met last Tuesday in an effort to defuse tension between the airline’s management and labor union amid a persistent strike threat of the PAL Employees Association (Palea) despite a Department of Labor and Employment (DoLE) ruling upholding the planned spin-off of PAL operations that would result in the layoff of 2,600 workers. PAL president Jaime Bautista, however, said there was no mention of a Palace intervention in the labor dispute at the meeting, adding that he has not received any call or official communication from the Palace regarding the scope, nature and effects of such intervention. Speaking to Manila reporters who traveled with him in Tokyo, Japan for the Asia Pacific Economic (Apec) Leaders’ Summit, Aquino, nevertheless, said government officials are preparing for a possible intervention in a bid to finally end the row between PAL and Palea. The controversial Reproductive Health (RH) Bill is losing its authors even as its proponents say that it is being endorsed by more than 100 lawmakers. According to Paranaque Rep. Roilo Golez the RH bill records show that there are only 49 lawmakers endorsing the bill which should have been tackled in the House committee on health rather than the House committee on population. “From my check of the records, the RH Bill (House Bill 96) has only 46 authors. It’s a far cry from the more than 100 than the RH author was boasting of in the last Congress. Looks like most of the previous co-authors are gone,” Golez said. Reacting to a statement made by former United States President Bill Clinton that a bigger population is a positive sign of growth, Golez said that pro-contraceptive advocates refuse to understand that people, children and babies are assets and not liabilities. Clinton was in Manila for a speaking engagement at the Manila Hotel. Labor Secretary Rosalinda Baldoz yesterday said that the pay rules governing a regular holiday, as well as core labor standards apply to all workers in the private sector on Nov. 16, 2010, being a national holiday in celebration of Eid’l-Adha which President Aquino declared. President Aquino, by virtue of Proclamation No. 60 issued on Nov. 9, 2010 declaring Eid’l Adha as a national holiday citing Republic Act (RA) No. 9849. The President said in his proclamation that the National Commission on Muslim Filipinos (NCMF) had recommended the national holiday for the observance of Eid’l Adha on Nov.16. Baldoz said RA 9849, provided that the Eid’l Adha shall be observed as a regular holiday in the country under a movable, rather than a fixed date, every year. Communist New People’s Army (NPA) rebels last Wednesday terrorized a civilian community in Davao del Sur province, taking residents as hostages after disarming government militiamen and carted away valuables of local residents, belated reports reaching Camp Aguinaldo showed yesterday. Lt. Col. Medel Aguilar, Army 10th Infantry Division (ID) public affairs chief, said fully-armed NPA members, led by a certain Bobo Fernandez of the NPA’s Guerrilla Front 72, started harassing members of the civilian volunteer organization (CVO) operating in Sitio Labidangan, Barangay Upper Bala in Magsaysay town around 5 a.m.
“The rebels carted away four homemade shot guns, one caliber .357 revolver, and divested some of the residents of their personal cellphones,” said Aguilar. Aguilar also said that the NPA band initially held several civilians as captives before retreating toward Mount Maponges also in Barangay Upper Bala. Employees of the national government are in for an early Christmas treat as Budget Secretary Florencio “Butch” Abad informed newsmen last Thursday night that the other half of their holiday cash gifts and 13th month pay of workers in the public sector may already be distributed starting Monday, Nov.15. The order is pursuant to the Budget Circular 2010-01 issued by the Department of Budget and Management (DBM) since the time of Abad’s predecessor, Joaquin Lagonera, for the fiscal year 2010 and shall cover all national government employees along with the military and uniformed personnel. The DBM stated that the government has allocated P12.8 billion to fund the remaining balance of the cash gift and 13th month pay of its employees since the first half of it was already given to them between April and May this year. Budget Secretary Florencio ‘Butch’ Abad, chief architect of the 2011 national budget of President Aquino, echoed the appeals issued by Malacanang recently with respect to the growing number of senators who are reportedly moving to slash, if not block, the ratification of the hefty P21-billion budget that the administration allotted for the conditional cash transfer (CCT) program of the Department of Social Welfare and Development (DSWD) once debates roll on the Senate floor. In an interview he granted to some reporters last Thursday evening, Abad said he understands where the concerns of most senators were coming from but he described them as “prospective” which are better addressed once the program has taken shape. “I don’t think that they [lawmaker critics] are questioning the program itself. Their questions are more or less along the lines of the ability of DSWD to absorb that the whole amount of money and some logistical concerns like: How are you going to monitor? How do you make sure that those in the list are legitimate? But, you know, these are questions that are better addressed after, you know, sometime towards the middle of next year because you know the past government is different,” Abad claimed when asked if the government is amenable to having the P21-billion budget slashed by the Senate just in case. Former Senior Superintendent Glenn Dumlao says he is standing by his earlier testimony clearing Sen. Panfilo Lacson has nothing to do with the murder of public relations man Salvador “Bubby” Dacer and his driver Emmanuel Corbito. In a statement sent by email to newsmen, Dumlao denounced lawyer Ferdinand Topacio’s call to include Dumlao in the Dacer and Corbito charge sheet if he cannot be used as a state witness. “For the record, I never abandoned my legal responsibility to the people of the Republic to testify truthfully and fully for the resolution of the case,” said Dumlao. Dumlao said Topacio bore him ill will for telling the truth that Sen.Lacson has nothing to do with the case.